An introduction to spherical, Euclidean and hyperbolic geometry in two and three dimensions, with an emphasis on the similarities and differences between these flavors of geometry. The most important tool in analyzing these geometries will be a study of their symmetries; we will see how this leads naturally to basic notions in group theory and topology. Topics to be covered might include classical tessellations, the Gauss-Bonnet theorem, scissors congruence, orbifolds, and fibered geometries. Syllabus for class; available as a .tex file, or as a .pdf file. Homework 1 - groups; available as a .tex file, or as a .pdf file. Homework 2 - the Euclidean plane; available as a .tex file, or as a .pdf file. Homework 3 - spherical geometry; available as a .tex file, or as a .pdf file. Homework 4 - hyperbolic geometry; available as a .tex file, or as a .pdf file. Homework 5 - surfaces and fundamental groups; available as a .tex file, or as a .pdf file. Homework 6 - properly discontinuous groups; available as a .tex file, or as a .pdf file. Final exam; available as a .tex file, or as a .pdf file. Answers to homework problems should take the form of complete sentences. It's important not merely to find the solution to a problem, but also to communicate that solution effectively. The final exam was posted on this webpage at noon on Thursday the 4th of January. Unpublished chapters 13a, 13b and 13c of Thurston's notes on orbifolds. The image to the right is Heaven and Hell (Circle limit IV) by Maurits C. Escher, the well-known 20th century Dutch artist. 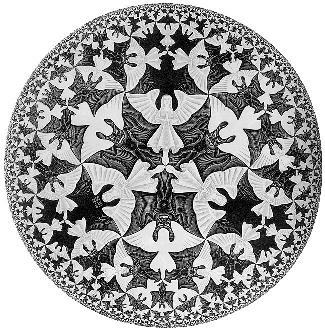 It depicts a tessellation of the hyperbolic plane by two kinds of tiles, angels and devils. The model of the hyperbolic plane used is the Poincaré (or conformal) model.